For other uses, see Rye (disambiguation). Rye (Secale cereale) is a grass grown extensively as a grain, a cover crop and a forage crop. It is a member of the wheat tribe (Triticeae) and is closely related to barley (genus Hordeum) and wheat (Triticum). Rye grain is used for flour, bread, beer, crisp bread, some whiskeys, some vodkas, and animal fodder. It can also be eaten whole, either as boiled rye berries or by being rolled, similar to rolled oats. Rye is one of a number of species that grow wild in central and eastern Turkey and in adjacent areas. Domesticated rye occurs in small quantities at a number of Neolithic sites in (Asia Minor) Turkey, such as the Pre-Pottery Neolithic B Can Hasan III near Çatalhöyük, but is otherwise absent from the archaeological record until the Bronze Age of central Europe, c. 1800–1500 BCE. It is possible that rye traveled west from (Asia Minor) Turkey as a minor admixture in wheat (possibly as a result of Vavilovian mimicry), and was only later cultivated in its own right. Although archeological evidence of this grain has been found in Roman contexts along the Rhine, Danube, and in Ireland and Britain, Pliny the Elder was dismissive of rye, writing that it "is a very poor food and only serves to avert starvation" and spelt is mixed into it "to mitigate its bitter taste, and even then is most unpleasant to the stomach". Winter rye is any breed of rye planted in the fall to provide ground cover for the winter. It grows during warmer days of the winter when sunlight temporarily warms the plant above freezing, even while there is general snow cover. It can be used to prevent the growth of winter-hardy weeds, and can either be harvested as a bonus crop or tilled directly into the ground in spring to provide more organic matter for the next summer's crop. It is sometimes used in winter gardens and is a common nurse crop. The nematode Ditylenchus dipsaci, leaf beetle, fruit fly, gout fly, cereal chafer, dart moth, cereal bug, Hessian fly, and rustic shoulder knot are among insects which can seriously affect rye health. Rye is grown primarily in Eastern, Central and Northern Europe. The main rye belt stretches from northern Germany through Poland, Ukraine, Belarus, Lithuania and Latvia into central and northern Russia. Rye is also grown in North America (Canada and the United States), in South America (Argentina, Brazil and Chile), in Oceania (Australia and New Zealand), in Turkey, in Kazakhstan and in northern China. 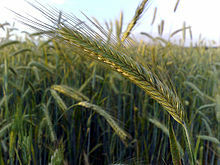 Production levels of rye have fallen in most of the producing nations, as of 2012. For instance, production of rye in Russia fell from 13.9 million metric tons (t) in 1992 to 2.1 t in 2012. Corresponding figures for other countries are as follows: Poland – falling from 5.9 t in 1992 to 2.9 t in 2005; Germany – 3.3 t to 3.9 Mt; Belarus – 3.1 t to 1.1 t; China – 1.7 t to 0.7 t. Most rye is consumed locally or exported only to neighboring countries, rather than being shipped worldwide. World trade of rye is low compared with other grains such as wheat. The total export of rye for 2016 was $186M compared with $30.1B for wheat. Poland consumes the most rye per person at 32.4 kg/capita (2009). Nordic and Baltic countries are also very high. The EU in general is around 5.6 kg/capita. The entire world only consumes 0.9 kg/capita. Rye is highly susceptible to the ergot fungus. Consumption of ergot-infected rye by humans and animals results in a serious medical condition known as ergotism. Ergotism can cause both physical and mental harm, including convulsions, miscarriage, necrosis of digits, hallucinations and death. Historically, damp northern countries that have depended on rye as a staple crop were subject to periodic epidemics of this condition. Such epidemics have been found to correlate with periods of frequent witch trials, such as the Salem witch trials in Massachusetts in 1692. Modern grain-cleaning and milling methods have practically eliminated the disease, but contaminated flour may end up in bread and other food products if the ergot is not removed before milling. Rye grain is refined into a flour. Rye flour is high in gliadin but low in glutenin. It therefore has a lower gluten content than wheat flour. It also contains a higher proportion of soluble fiber. Alkylresorcinols are phenolic lipids present in high amounts in the bran layer (e.g. pericarp, testa and aleurone layers) of wheat and rye (0.1–0.3% of dry weight). Rye bread, including pumpernickel, is made using rye flour and is a widely eaten food in Northern and Eastern Europe. Rye is also used to make crisp bread. Rye grain is used to make alcoholic drinks, like rye whiskey and rye beer. Other uses of rye grain include kvass and an herbal medicine known as rye extract. Rye straw is used as livestock bedding, as a cover crop and green manure for soil amendment, and to make crafts such as corn dollies. Physical properties of rye affect attributes of the final food product such as seed size and surface area, and porosity. The surface area of the seed directly correlates to the drying and heat transfer time. Smaller seeds have increased heat transfer, which leads to lower drying time. Seeds with lower amounts of porosity also have lower tendencies to lose water during the process of drying. Rye grows well in much poorer soils than those necessary for most cereal grains. Thus, it is an especially valuable crop in regions where the soil has sand or peat. Rye plants withstand cold better than other small grains do. Rye will survive with snow cover that would otherwise result in winter-kill for winter wheat. Most farmers grow winter ryes, which are planted and begin to grow in autumn. In spring, the plants develop and produce their crop. Fall-planted rye shows fast growth. By the summer solstice, plants reach their maximum height of about a 120 cm (4 ft) while spring-planted wheat has only recently germinated. Vigorous growth suppresses even the most noxious weed competitors and rye can be grown without application of herbicides. Rye is a common, unwanted invader of winter wheat fields. If allowed to grow and mature, it may cause substantially reduced prices (docking) for harvested wheat. Along with Secale cereale's relationship and impact on the environment, it is also a valuable species because of its expansive diversity and uses. In northern Portugal, fourteen different populations of S. cereale were analyzed in order to better understand their differences. It was discovered that the storage proteins are very diverse and possess a lot of overall genetic variation as well, which is useful information to know because scientists can use its diversity in breeding to produce the most efficient cultivar of S. cereale, or rye. Moreover, the beneficial characteristics of S. cereale can also be used to improve certain characteristics of other useful plants, like wheat. The pollination abilities of wheat were vastly improved when there was cross-pollination with S. cereale. The addition of the rye chromosome 4R increased the size of the wheat anther along with increasing the number of pollen grains present. Along with improved wheat, the optimal characteristics of S. cereale can also be combined with another perennial rye, specifically S. montanum Guss, in order to produce S. cereanum, which has the beneficial characteristics of each. The hybrid rye (S. cereanum) can be grown in all environments, even with less than favorable soil and protects some soils from erosion. In addition, the plant mixture has improved forage and is known to contain digestible fiber and protein. Information about the diversity, the genome and S. cereanum’s ability to cross fertilize with other species is useful information for scientists to know as they attempt to come up with various plant species that will be able to feed humanity in the future without leaving a negative footprint on the environment. The harvesting of rye is similar to that of wheat. It is usually done with combine harvesters, which cut the plants, thresh and winnow the grain, and either gather the straw onto wagons or release it to the field as soil amendment. The resultant grain is stored in local silos or transported to regional grain elevators and combined with other lots for storage and distant shipment. Before the era of mechanised agriculture, rye harvesting was a manual task performed with scythes or sickles. The cut rye was often shocked for drying or storage, and the threshing was done by manually beating the seed heads against a floor or other object. Like wheat, barley, and their hybrids and derivatives, rye contains gluten, which makes it an unsuitable grain for consumption by people with gluten-related disorders, such as celiac disease, non-celiac gluten sensitivity, and wheat allergy, among others. Nevertheless, some wheat allergy patients can tolerate rye or barley. Ergotism is an illness that can result from eating rye and other grains infected by ergot fungi (which produce LSD-25-like toxins in infected products). Although it is no longer a common illness because of modern food safety efforts, it was common before the 20th century, and it can still happen today if food safety vigilance breaks down. ^ "Forage Identification: Rye". University of Wyoming: Department of Plant Sciences. September 26, 2017. Retrieved September 26, 2017. ^ McElroy, J. Scott (2014). "Vavilovian Mimicry: Nikolai Vavilov and His Little-Known Impact on Weed Science". Weed Science. 62 (2): 207–216. doi:10.1614/ws-d-13-00122.1. ^ Gyulai, Ferenc (2014). "Archaeobotanical overview of rye (Secale Cereale L.) in the Carpathian-basin I. from the beginning until the Roman age". Journal of Agricultural and Environmental Science. 1 (2): 25–35. Retrieved July 14, 2016. page 26. ^ Evans, L. T.; Peacock, W. J. (March 19, 1981). Wheat Science: Today and Tomorrow. Cambridge University Press. p. 11. ISBN 978-0-521-23793-2 – via Google Books. ^ Pliny the Elder (1855) [c. 77–79]. The Natural History. Translated by Bostock, John; Riley, H. T. London: Taylor and Francis. Book 18, Ch. 40. Retrieved July 12, 2016 – via Perseus Digital Library, Trufts University. ^ Hillman, Gordon; Hedges, Robert; Moore, Andrew; Colledge, Susan; Pettitt, Paul (2001). "New evidence of Lateglacial cereal cultivation at Abu Hureyra on the Euphrates". The Holocene. 11 (4): 383–393. doi:10.1191/095968301678302823. Retrieved July 12, 2016. ^ Burgos, Nilda R.; Talbert, Ronald E.; Kuk, Yong In (2006). "Grass-legume mixed cover crops for weed management". In Sing, Harinder P.; Batish, Daisy Rani; Kohli, Ravinder Kumar (eds.). Handbook of Sustainable Weed Management. New York: Haworth Press, Inc. p. 110. ISBN 978-1-56022-957-5. ^ Matz, Samuel A. (1991). Chemistry and Technology of Cereals as Food and Feed. New York: Van Nostrand Reinhold/AVI. pp. 181–182. ISBN 978-0-442-30830-8. Retrieved July 14, 2016. 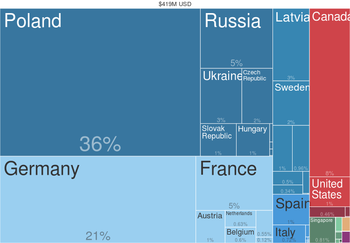 ^ a b "Major Food and Agricultural Commodities and Producers: Countries by Commodity". FAO.org. Food and Agriculture Organization of the United Nations. 2005. Retrieved January 8, 2015. ^ a b Wong, George J. (1998). "Ergot of Rye: History". Botany 135 Syllabus. University of Hawai‘i at Mānoa, Botany Department. Retrieved July 12, 2016. ^ Petruzzello, Melissa. "Ergot". Britannica. Encyclopædia Britannica, Inc. Retrieved March 3, 2019. ^ Suzuki, Yoshikatsu; Esumi, Yasuaki; Yamaguchi, Isamu (1999). "Structures of 5-alkylresorcinol-related analogues in rye". Phytochemistry. 52 (2): 281–289. doi:10.1016/S0031-9422(99)00196-X. ^ Prättälä, Ritva; Helasoja, Ville; Mykkänen, Hannu (2000). "The consumption of rye bread and white bread as dimensions of health lifestyles in Finland". Public Health Nutrition. 4 (3): 813–819. doi:10.1079/PHN2000120. PMID 11415489. Retrieved July 15, 2016. ^ a b Jouki, Mohammad; Emam-Djomeh, Zahra; and Khazaei, Naimeh (2012) "Physical Properties of Whole Rye Seed (Secale cereal)," International Journal of Food Engineering: Vol. 8: Iss. 4, Article 7. ^ Lyon, Drew J.; Klein, Robert N (May 2007) . "Rye Control in Winter Wheat" (Revised ed.). Institute of Agriculture and Natural Resources, University of Nebraska, Lincoln Extension. Archived from the original on April 13, 2014. Retrieved July 12, 2016. ^ Hon, W. C.; Griffith, M.; Chong, P.; Yang, D. S.-C. (March 1, 1994). "Extraction and Isolation of Antifreeze Proteins from Winter Rye (Secale cereale L.) Leaves". Plant Physiology. 104 (3): 971–980. doi:10.1104/pp.104.3.971. ISSN 1532-2548. PMC 160695. PMID 12232141. ^ Ribeiro, Miguel; Seabra, Luís; Ramos, António; Santos, Sofia; Pinto-Carnide, Olinda; Carvalho, Carlos; Igrejas, Gilberto (April 1, 2012). "Polymorphism of the storage proteins in Portuguese rye (Secale cereale L.) populations". Hereditas. 149 (2): 72–84. doi:10.1111/j.1601-5223.2012.02239.x. ISSN 1601-5223. PMID 22568702. ^ Nguyen, Vy; Fleury, Delphine; Timmins, Andy; Laga, Hamid; Hayden, Matthew; Mather, Diane; Okada, Takashi (February 26, 2015). "Addition of rye chromosome 4R to wheat increases anther length and pollen grain number". Theoretical and Applied Genetics. 128 (5): 953–964. doi:10.1007/s00122-015-2482-4. ISSN 0040-5752. PMID 25716820. ^ Sipos, Tamás; Halász, Erika (April 25, 2007). "The role of perennial rye (Secale cereale × S. montanum) in sustainable agriculture". Cereal Research Communications. 35 (2): 1073–1075. doi:10.1556/CRC.35.2007.2.227. ISSN 0133-3720. ^ Bauer, Eva; Schmutzer, Thomas; Barilar, Ivan; Mascher, Martin; Gundlach, Heidrun; Martis, Mihaela M.; Twardziok, Sven O.; Hackauf, Bernd; Gordillo, Andres (March 1, 2017). "Towards a whole-genome sequence for rye (Secale cereale L.)". The Plant Journal. 89 (5): 853–869. doi:10.1111/tpj.13436. ISSN 1365-313X. PMID 27888547. ^ Jensen, Joan M. (1988). Loosening the Bonds: Mid-Atlantic Farm Women, 1750–1850. New Haven: Yale University Press. p. 47. ISBN 978-0-300-04265-8. Retrieved July 17, 2016. ^ Jones, Peter M. (2016). Agricultural Enlightenment: Knowledge, Technology, and Nature, 1750–1840. Oxford: Oxford University Press. p. 123. ISBN 978-0-19-102515-0. Retrieved July 17, 2016. ^ Tovoli, F.; Masi, C.; Guidetti, E.; Negrini, G.; Paterini, P.; Bolondi, L. (March 16, 2015). "Clinical and diagnostic aspects of gluten related disorders". World Journal of Clinical Cases. 3 (3): 275–284. doi:10.12998/wjcc.v3.i3.275. PMC 4360499. PMID 25789300. ^ Pietzak, M. (January 2012). "Celiac disease, wheat allergy, and gluten sensitivity: When gluten free is not a fad". Journal of Parenteral and Enteral Nutrition. 36 (1 Suppl): 68S–75S. doi:10.1177/0148607111426276. PMID 22237879. ^ Belser-Ehrlich S, Harper A, Hussey J, Hallock R (2013). "Human and cattle ergotism since 1900: symptoms, outbreaks, and regulations". Toxicol Ind Health (Review). 29 (4): 307–16. doi:10.1177/0748233711432570. PMID 22903169. Schlegel, Rolf (2006). "Rye (Secale cereale L.): A Younger Crop Plant with Bright Future". In Sing, R. J.; Jauhar, P. (eds.). Genetic Resources, Chromosome Engineering, and Crop Improvement. Vol. II – Cereals. Boca Raton, Florida: CRC Press. pp. 365–394. ISBN 978-0-8493-1430-8. Schlegel provides a 2011 updated version online. Schlegel, Rolf; Korzun, V. (2016). "Genes, Markers, and Linkage Data of Rye (Secale cereale L.)". 08.16. Retrieved July 12, 2016. Schlegel, Rolf (2016). "Current List of Wheats with Rye and Alien Introgression". Rye-Gene-Map.de. 05.16. Retrieved July 12, 2016. "Growing Rye". December 1959. Retrieved July 12, 2016 – via University of North Texas Library, Government Documents Department.